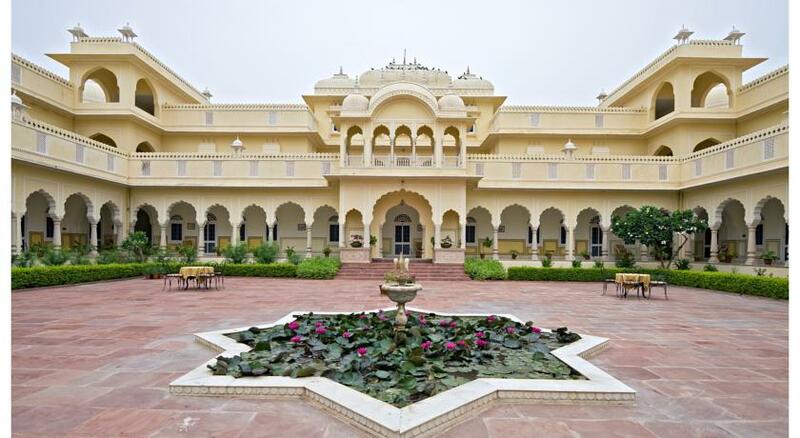 Located at the foothills of the Aravali Mountains, Nahargarh is a luxurious hotel that is just next to the famous Ranthambore National Park. 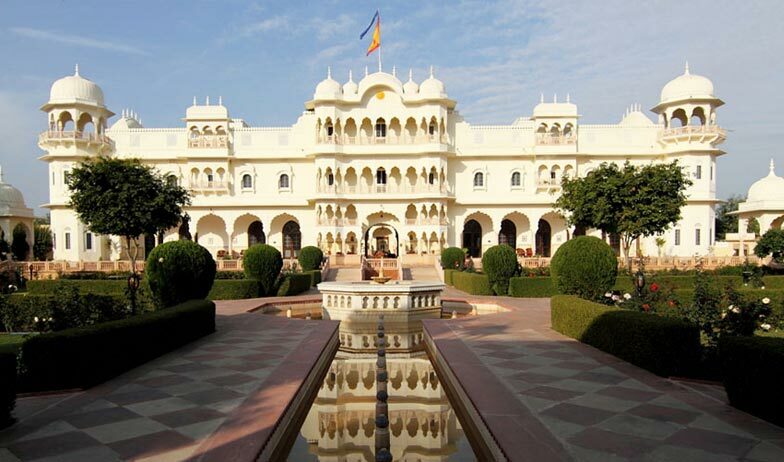 It is built on a traditional theme of the Rajput hunting palace that has a vast Mughal Garden or the Char Bagh. 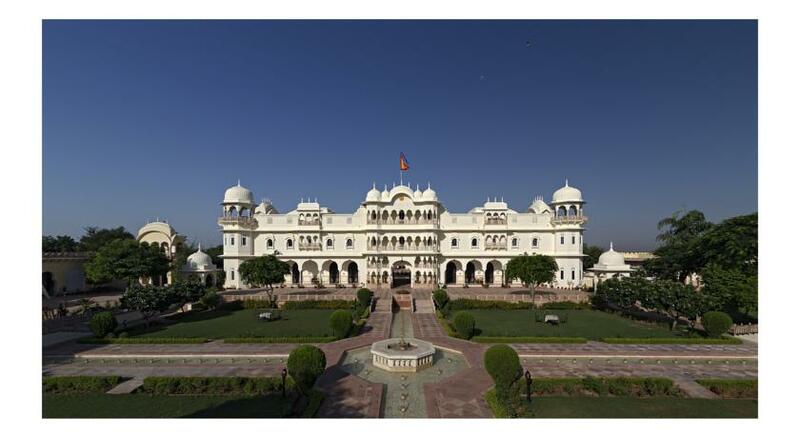 If you are amongst those who wish to explore the National Park in complete luxury, then Nahargarh is the best option for your stay. In the surrounding grasslands, the guests can enjoy the acts of several birds and animals in their natural habitat. Being close to the National Park replete with some of the best amenities and facilities, travelers choose to stay here at all times. The resort boasts of 68 well-appointed luxurious rooms and world class facilities for all the esteemed guests. For the connoisseurs of fine dining, there is wide range of cuisines available in the multi-cuisine restaurant that is nestled in the resort. 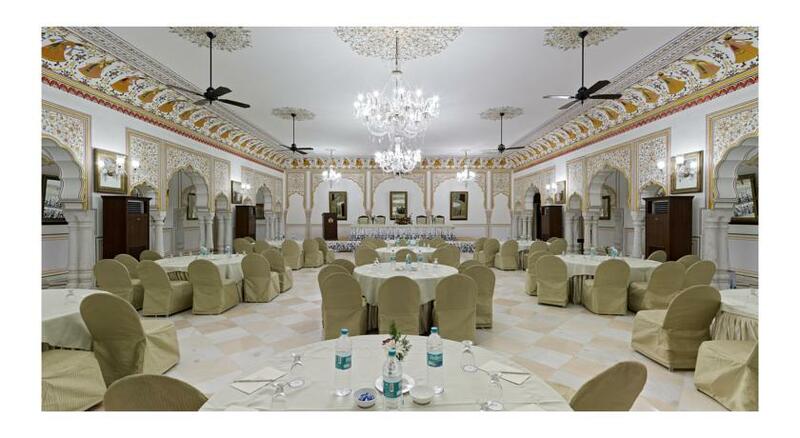 Are you visiting Ranthambore for some business reasons, then the availability of perfectly appointed conference halls in Nahargarh will assist you in holding presentations, conferences, business meetings and more. And yes, if you wish to get married in grand style, then this is the place to be where all your dreams will come true. Some of the other facilities available include a swimming pool, doctor on call, ample car parking area, recreation area, travel guide and a reading hall for all the guests. 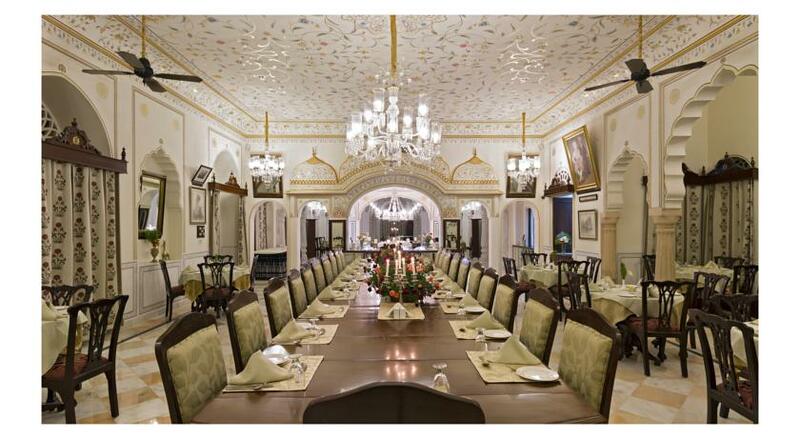 Even the Standard Rooms at Nahargarh speak volumes about luxury in every sense. All of them are located in peaceful surroundings. Attached with a courtyard that offers a panoramic view of the jungle, these rooms let you stay attached to the nature at all times. Each room is designed perfectly and a unique setting and palate of colors and hues. 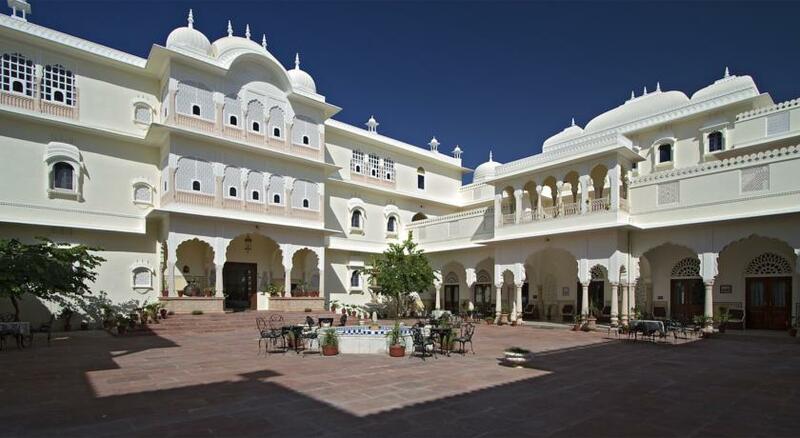 Regal Rajput style of living can be experienced here. Over and above the traditional furniture and furnishings, these rooms boast of amazing world class amenities and facilities that are required for a comfortable living. Each room has a double bed with comfortable mattresses and two pillows. A sofa set with center table adorns the living area. 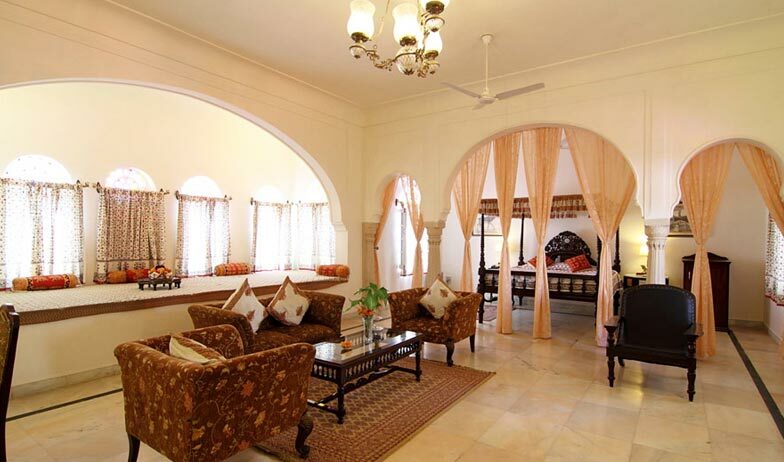 The guests can enjoy various satellite channels on the large LCD TV that is fitted in the rooms. There is availability of free internet facility and direct dial telephone line to help you stay connected with your loved ones. The attached bathroom has round the clock supply of hot and cold water and offers premium toiletries and more. The Deluxe Rooms are more luxurious than the Standard rooms. 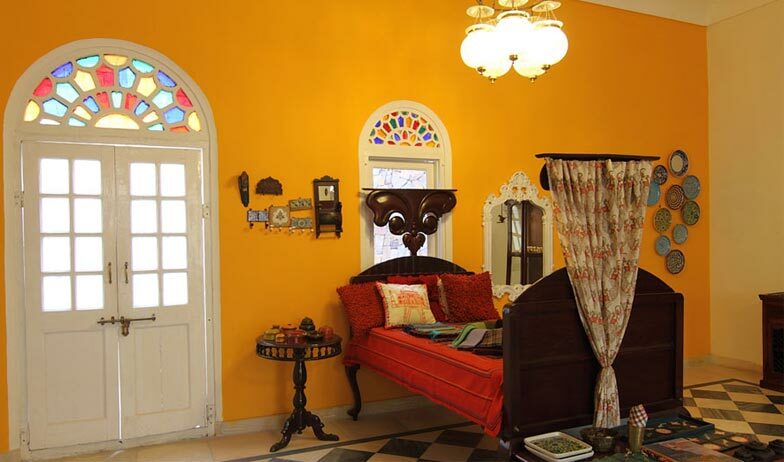 They are elegantly designed based on the theme of Rajput living. 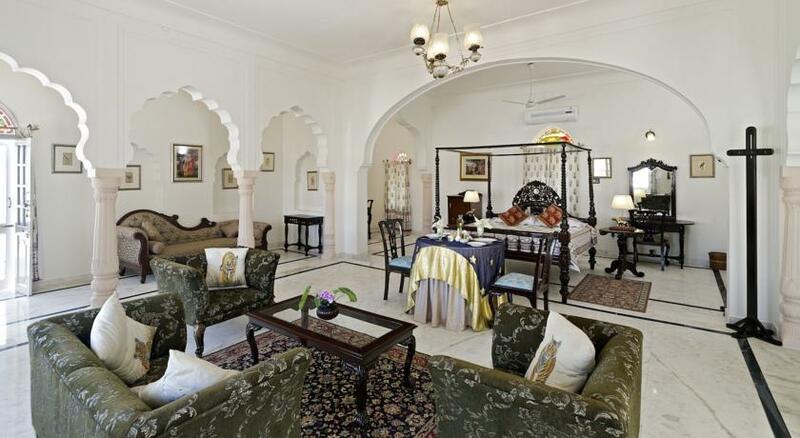 Vast rooms with traditional furniture and furnishings, they offer world class amenities to the guests. A huge double bed/ twin bed can be selected as per your specific requirements. An LCD TV displays all major satellite channels, a direct dial telephone with STD and ISD facility, a Mini Bar stacked with selected beverages and snacks to ease off your mid meal hunger pangs, a safe deposit locker, complimentary fruit basket, water bottle, complimentary internet facility, air-conditioner with in-room temperature control are some of the facilities that you can look forward to when you decide to stay at these rooms. Also available is an attached grand bathroom with four fixture fittings and shower area, round the clock water supply, slippers and premium branded toiletries for your use. 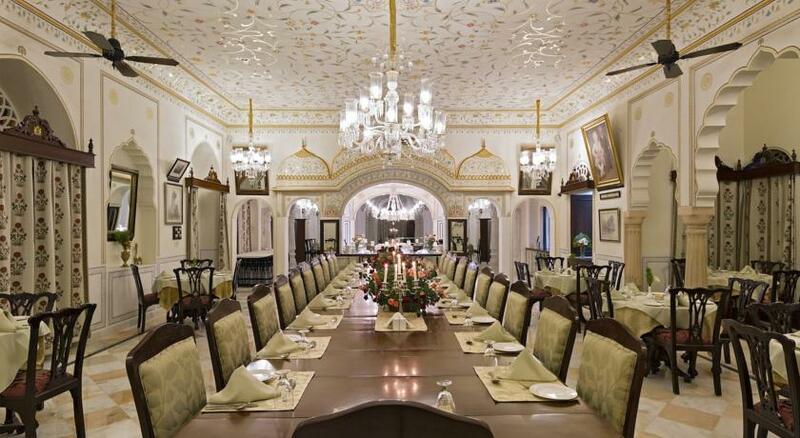 Want to live life like the Maharajas? 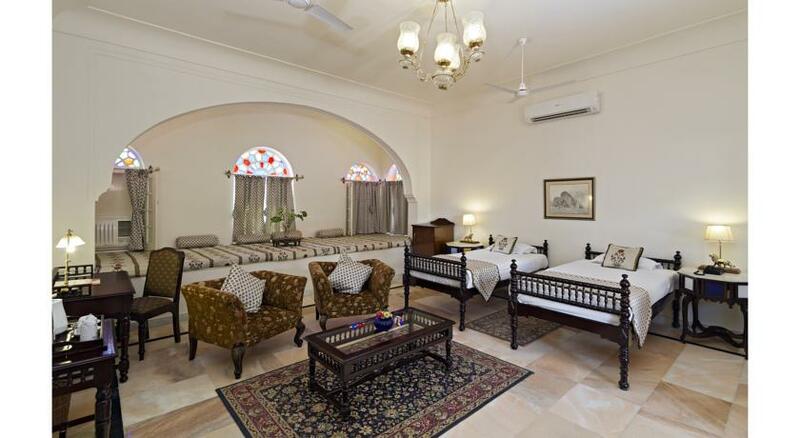 Well, the Super Deluxe Rooms at Nahargarh will offer you that and even more. These rooms are epitome of utmost luxury, their style, elegance and comfort knows no bounds. Decorated in a traditional theme with some of the best available furnishings and furniture, these rooms are well appointed with world class amenities and facilities to make your stay as comfortable as possible. A lavish double bed/twin bed, a large LCD TV that displays all satellite channels, a sofa and a center table with candle lamp in the center, a closet, a safe deposit locker are some of the amenities that are available in these rooms. Availability of complimentary internet facility, telephone line with direct dial STD and ISD facility assists you stay connected at all times. The en suit bathroom is huge and lavish too and offers round the clock supply of hot and cold water, premium branded toiletries, separate shower area and more. 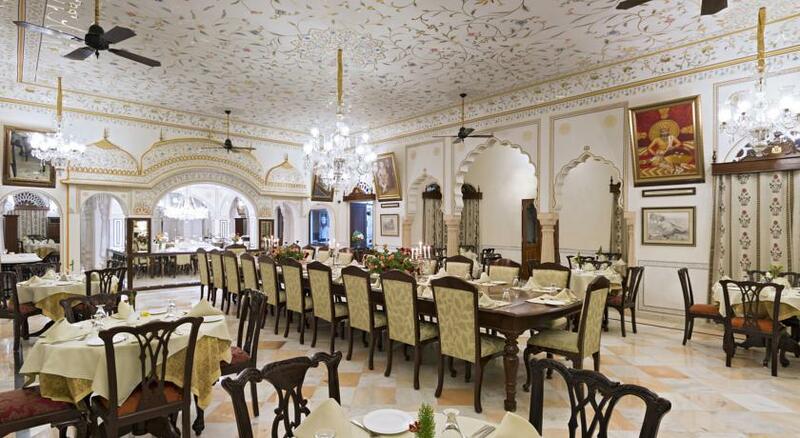 Want to enjoy lip smacking cuisines from all over the world in the royal ambiance, head straight to the in-house multi-cuisine restaurant at Nahargarh. 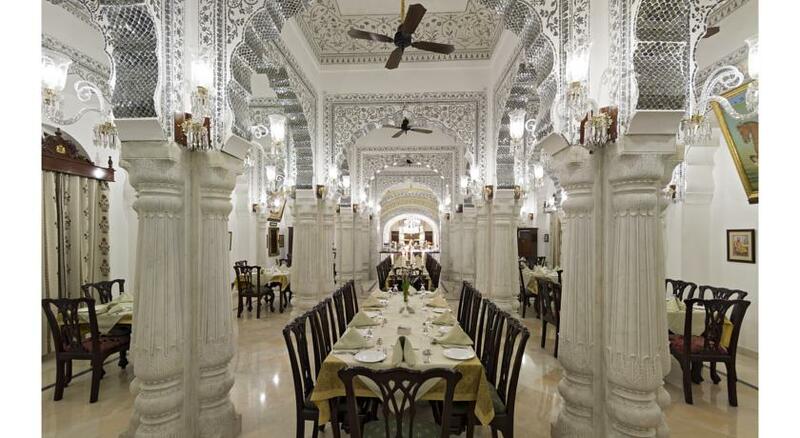 This restaurant is designed in a way that will catch the fancy of even the Rajput Maharajas. 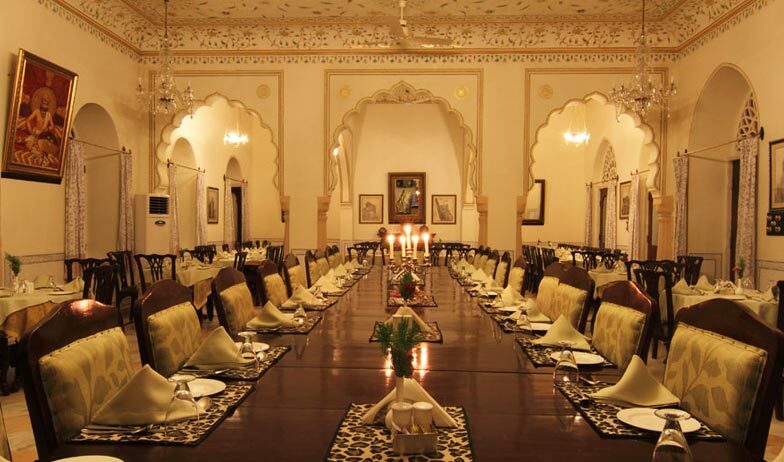 Huge dining hall decorated in a traditional theme with large tables and comfortable chairs. The hues are varied and very eye-catching yet relaxing. The master chefs utilize some of the best ingredients to create the magic of different tastes and aromas in the most hygienic manner. The hospitality offered by the hotel staff knows no bounds when it comes to satisfying the patrons enjoying their breakfast, lunch or dinner. You will have the most delectable and wonderful dining experience when you enjoy finger licking meals with your loved ones at this restaurant. 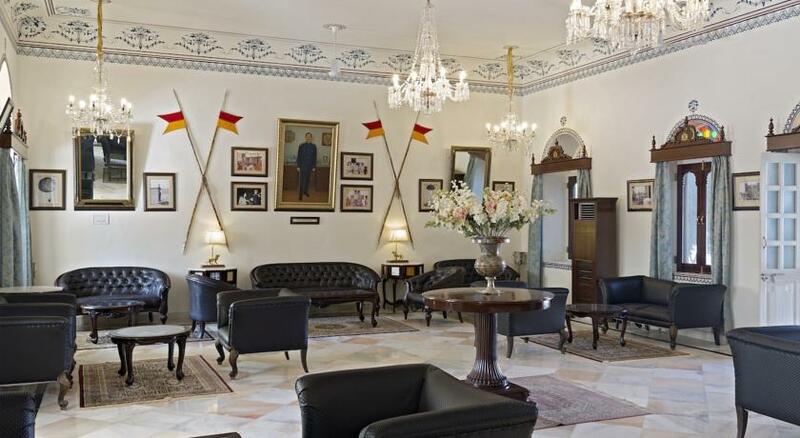 Tired after a day long trip to the Ranthambore National Park, then hit the Lancer’s Bar. 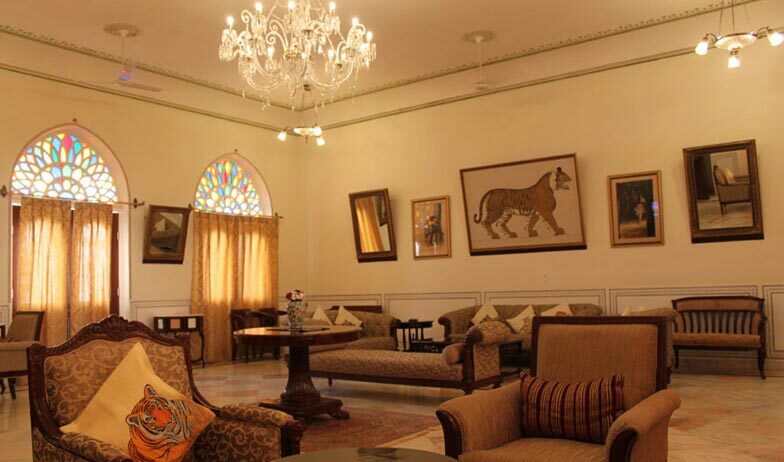 The Lancer’s Bar at Nahargarh offers a classy ambiance along with elegant interiors. It serves an assortment of cocktails, mocktails, single malts, wines, whiskeys and other spirits of all popular Indian and international brands. The drinks can also be complemented with delectable finger food and snacks that are available here. If you wish to enjoy and chill out, then Lancer’s Bar is the place to be.